by Victor Gijsbers. Published February 2, 2015 in Issue 61.5. An analysis of the puzzle mechanics in Robert Patten’s The Hours, by Victor Gijsbers. There is a scene halfway through Robert Patten’s The Hours, from the 2011 IF Competition, where the protagonist meets Maurice, a scientist who designs time travel equipment. In keeping with genre conventions, Maurice’s laboratory has just exploded; and in keeping with other genre conventions, he is all too willing to tell and even demonstrate to us how it happened. We already learned in an earlier scene that one travels through time by wearing a “tick,” which only works when submerged in water. Maurice is working on ticks that will allow you to travel to the future. But current test results are not encouraging, as he is about to show us. Maurice gives the player character a glass of water, takes a tick that is programmed to travel into the future, and drops it into the glass, where it promptly disappears – as it should. So what’s the problem? Maurice gestures to the ruins of the door. This is a lethal situation. If you don’t type exactly the right command at that prompt, you will be blown into smithereens by an exploding tick. But this is not an old-school IF puzzle, where you have to try dozens of moves to slowly work out the solution. On the contrary, it is almost inconceivable that you do not immediately and automatically type in one of the few commands that will save your life. You throw the glass. It busts in midair. This is a satisfying moment. You understood the author, you felt drawn into the scene, you did that which was obvious to you, and the game responded in exactly the way that you hoped. We can agree that the second puzzle, while perhaps not particularly interesting, gives at least some satisfaction when solved. The first, on the other hand, is barely fit to be called a puzzle at all. You know the solution as soon as you see the puzzle, and the knowledge does not satisfy. Let us compare The Hours to All Things Devours, a game from the 2004 IF Competition that also revolves around time travel. The puzzles in All Things Devours are hard. You must wrestle with a complicated system until you come to understand its rules; you then need to come to several critical insights; and finally you must combine them in smart ways to achieve your goals without causing a lethal time travel paradox. Congratulations! Solving these puzzles is a real achievement, and it feels that way. Now look at The Hours. If it stood to All Things Devours as our puzzle 1 stands to our puzzle 2, then The Hours ought to be a particularly unsatisfying game, and ought to have been more satisfying if its puzzles had been more difficult. But neither of these conclusions is true. Dropping the glass feels good, even though it is no achievement at all, and if the dropping of the glass hadn’t been clued so well, if the player would have had to search for the right command, this might have been a frustrating moment in the game rather than a moment of small joy. There must, then, be a kind of satisfaction that is independent of achieving a difficult goal: a kind dependent on the puzzles being trivial. But what kind of satisfaction could that be? The sign saying “Stockholm” points north. You arrive at a small mill. There is a sign here. That scene would certainly not be interesting. Why not? Is it simply that this scene is repetitive, and requires me to do the same actions over and over again? No – while repetition would obviously rob the glass scene in The Hours of its power to satisfy, the travel scene would be boring and unsatisfactory even if it consisted of only one location to traverse. Before discussing another, more interesting option, I want to talk about the final puzzle in The Hours, the one for which the glass dropping scene is only the preparation. Near the end of the game, the player character is captured by her original self, Alpha, and strapped to a table where her organs will be ‘harvested’. Alpha arrogantly tells you about her genius and how she will achieve eternal youth because of all the bodies cloned through time travel that are at her disposal. At this point of the game the player is completely helpless; you cannot take any action that will allow you to escape. Of course, you don’t know that, and so you are going to do what a player in such a situation will always do: check your inventory and see whether you’re carrying anything that might help. You have only one thing: a tick set for the future, contained in a jewelry box. Unfortunately, that isn’t going to help you. After all, ticks only activate in water. So you dismiss the possibility, and look for other way to escape, while Alpha keeps on droning about her superiority. A flaming mass of rock shoots into the operating room. The impact flips the operating table, severing the straps. The sprinklers above spray a torrent of water into the cavern. You tumble to the floor. The jewelry box pops open. The tick lights up in response to the water, and is gone. The fires are out, but now everything is drenched. The robots have stopped moving. Alpha still has her scalpel, and it looks like she’s going to use it on you anyway. All you have is an empty jewelry box. You throw the empty box at Alpha. She catches it in surprise. The rest, of course, is a fiery explosion, and victory. Again the puzzle is trivial. The whole game has been designed with this moment in mind, to make it obvious to me that throwing the box at my enemy will cause her death. And again the moment is very satisfying, even more satisfying then the one with the glass, because this time I don’t just save my own life, but also defeat my primary and hated antagonist. So what is it that makes these scenes so enjoyable? My suggestion is that it is something I would like to call immersive agency and which consists in (a) a sudden identification with the player character that (b) leads to recognition and performance of the (or an) action that (c) is gleefully acknowledged by the game to be the (or a) right one. Let’s work that out that step by step. (a) Normally, the thinking of the player can be quite distant from that of the player character. For instance, nobody believes that the protagonist of an interactive fiction is in the habit of methodically examining every object in the room. As another example, when the player is stuck mulling over a puzzle, it need not be fictionally true that the character is stuck in the same way – the entire fictional time of all our attempts to solve the puzzle may be just a single second, and the character may not even realise that there is a puzzle to be solved. But in the scenes I picked from The Hours, this gap disappears. The player and the player character have the exact same realisation at the exact same moment; and this gives the feeling that we really step into the scene. For a moment, our thoughts and feelings coincide with those of the protagonist. (b) The sudden insight of the player and the player character takes the form of knowledge that a certain action must be taken; and the player and player character both have the power to perform this action (on their respective levels of reality). Thus we do not merely step into the scene, we take control of it. (c) In all collaborative story telling, control over the story is only real if it is acknowledged by others. In improvisational theatre, I need the other actors to pick up on my ideas and run with them. In a roleplaying game, my fellow players must agree that I had the authority to make the claims I just did; otherwise, they will not become part of our shared fiction. And in a piece of interactive fiction, the program must respond in a way that shows it has understood my action and has changed the state of the world accordingly (if such a change is required). By allowing me to take the action, and by describing it in such a way that it becomes clear that this was the action I was meant to take and that it has the result that I had anticipated, the game acknowledges my control. These three elements together constitute a form of agency that is not as ubiquitous in interactive fiction as one might naïvely think. Much of our interaction with games comes in the form of exploration, puzzle solving, or decision making. It is only with a small minority of our actions that we take control of the action in the way I just described in (b) and (c); and even then, it is rarely the case that we have the sudden feeling of identification described in (a). But this type of agency, when it is achieved, is very satisfying. 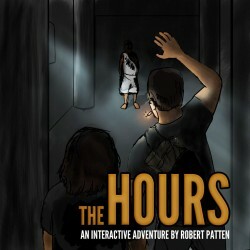 Perhaps more than other types it really immerses us into the fiction, if only for a moment, and allows us to experience almost first-hand that element of human experience that interactive fiction ought to be particularly good at representing: action. What makes The Hours interesting from a design perspective is how the entire game has been set up to enable several moments where immersive agency becomes possible. I discern two major lessons. First, the necessity of detailed preparation that allows the player to perceive non-standard actions as obviously the right ones. The way that the glass scene sets up the jewelry box scene is an excellent example of this. Second, the necessity of distracting the player. The Hours gives us an elaborate and somewhat dizzying time travel story with several characters that turn out to be clones of each other, with alternate realities, and so on … none of which is terribly important to the narrative, but all of which keeps us busy so that we haven’t been thinking about exploding ticks for a while when the moment comes that we need to think about them again. Without this distraction, the player might see what is going to happen too clearly; and she might then feel too manipulated to enjoy the control when it is finally given to her. But now she has been spending her mental energy on keeping track of the story, and the moment of agency comes as a sudden and surprising present. In conclusion: extremely trivial puzzles can be very satisfying, if they are used to create moments of immersive agency. Given that I have been very critical about the ideal of immersion in the past, and have doubted its ability to give much satisfaction, this conclusion comes as something of a surprise to me. This article was published in Issue 61.5 on February 2, 2015 by Victor Gijsbers. It is tagged SPAG Specifics. That’s very interesting especially in light of the discussion about Robinson Wheeler’s “Moonbase Indigo,” which has a similar feel almost throughout (a few of the puzzles are trickier). There was a bit of discussion later in the thread about what to call the kind of IF Rob was doing there; “Immersive agency” is a nice way to think of it. The parallel isn’t quite exact because Moonbase Indigo employs a lot of non-standard (but well cued) IF commands to solve its puzzles, whereas the puzzles from the Hours that you mentioned use standard library commands. But it’s an interesting parallel. I wonder if it’s possible to achieve something similar in a choice-based piece?